Tactical Mind is an inexpensive, basic, and highly abstract strategy board game. With its Tron-like neon aesthetic, it’s certainly stylish enough, but as a massive (massive) Tron fan I can say that that’s the least interesting thing about the game. I came for the aesthetic, but I stayed for the utter genius of it all. There’s a single playing piece in Tactical Mind; a pawn. You build pawns using the game’s single resource (“energy”), and those pawns do a couple of different things; if they’re built next to an energy crystal, they’ll collect energy for you each turn. Or they can be used to upgrade other pawns that they sit next to (each pawn can be upgraded four times, to “level 5”). Finally, they can be used to either attack enemy pawns (when your pawn is of an equal or higher level than the enemy), or temporarily knock the enemy pawn out of commission, making it useless to your opponent for his or her next turn (if the pawn is of a lower level). The goal is to “attack” the enemy base on the other end of the playing field, which results in an instant victory for you. That’s it. That’s the entire game. Like many of the very greatest board games, however, its the simplicity of systems in Tactical Mind, and the complexity of what those systems represent, is the game’s very strength. The strategy in this game is so incredibly deep. Firstly, you need to consider placement of pawns around the board. Each map is different and requires a different approach, but the placement of those energy crystals, and the kind of access that the opponent has to your home base, will always affect the strategies you can take. In a very abstract manner the game represents every major consideration that military tacticians need to make; supply lines are important, as pawns need to be linked to one another. A defensive line that has been broken down will often lead to the opponent making a great deal of progress deep within your territory. Disrupting an opponent’s ability to gather resources is almost always more successful than attacking head-on like a blunt instrument. For example, mechanically, a level 5 pawn is ridiculously potent. Not only is it the only pawn that can actually move across the battlefield (all other “levels” of pawns are rooted to the spot until they are upgraded to level 5), but it can only be destroyed by another level 5 pawn. 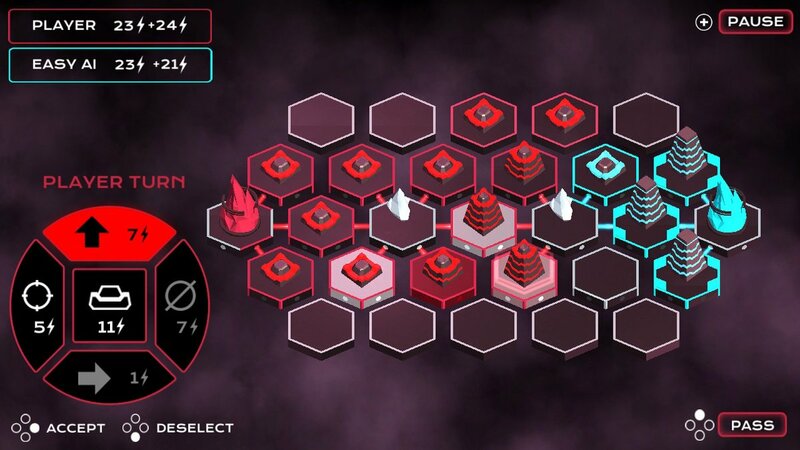 On top of that, level 5 pawns positioned next to energy crystals generate the most resources back to your own base. 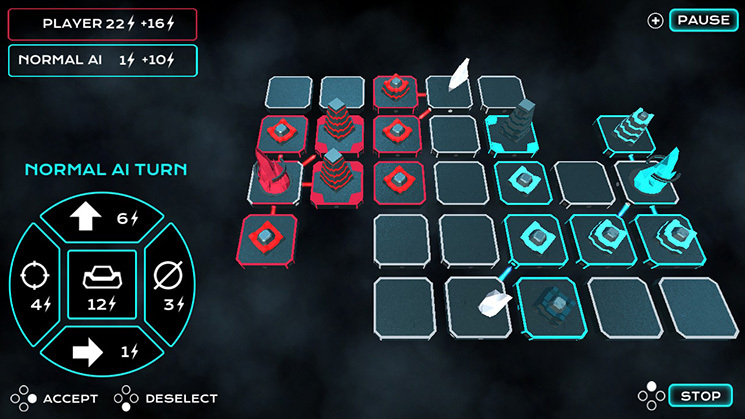 On that basis you’d think that the most effective strategy would be to level a pawn up to level 5, and then simply have it slowly move towards the enemy base (even though these pawns are mobile they are still restricted to moving one space per turn), rolling over everything that stands before it, but in practice it takes a lot of resources to build up a level 5 pawn (more on that in a second), and those pawns can be easily countered by a humble level 1 pawn using the ability to “knock out” an enemy pawn for one turn – as long as the enemy pawn continues to do this, that level 5 pawn you’ve spent so many resources building will be stranded and useless. That’s the military strategy side of Tactical Mind, but that's just one side of it. There are also clear abstractions of economic and commercial strategy at play in the game, playing fully to the popular truism that Sun Tzu’s The Art Of War applies as much to capitalist business behaviour as it does armies on the march. Every action you take in Tactical Mind costs resources – be that attacking an enemy pawn, or building or upgrading your own pawns. The catch is that with every action that you take, the cost of doing that action the next time increases by one energy point. Say for example that building a new pawn costs four energy points. If you were to build three pawns on your turn (costing four, five and then six energy points), your opponent would need seven energy points to produce just one pawn on his or her own turn. It’s an incredibly basic and fundamental representation of how real world markets work, but it opens up a range of strategic imperatives you need to account for. For example; it’s not enough just to focus on spending resources on the stuff you need to accommodate your strategic approach to a map. You also need to interpret the actions that your opponent is undertaking, and manipulate the energy market to make things as difficult as possible for him or her. Many times one of the most devastating strategies you’ll have at your disposal is to build pawn after pawn that you don’t need, solely to drive up the cost for your opponent to do the same, and therefore make their own strategies cost inefficient, and therefore ineffective. Capitalism just loves promoting wasteful tactics and resource exploitation like that. It’s a little sickening to actually dwell on, but in the world of Tactical Mind, you’ve got little option but to indulge these less than moral strategies. There’s just no way to be successful otherwise. Just like we don’t have the option of stepping away from capitalism in the really real world, either. 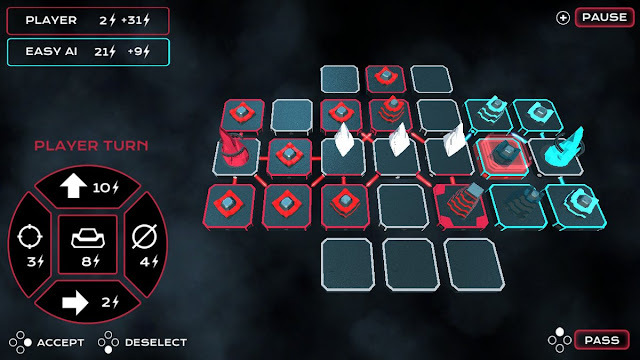 So, as you can see, beneath that incredibly simple exterior of Tactical Mind is a deeply, powerfully nuanced strategy game, and, not unlike the most nuanced board game of all (Go), is the kind of game that you’ll learn in an instant, but actually mastering is a lengthy learning process. 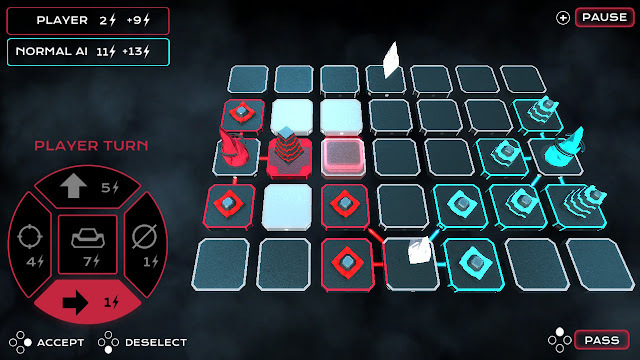 I’m not suggesting that people will end up writing entire books on this game, like they have the likes of Go and chess, but Tactical Mind definitely has that same minimalist approach to mechanics that, somewhat ironically, makes for a far more engaging mental challenge. What lets Tactical Mind down is the fact it’s around the price of a coffee to buy. Because it’s so cheap, the developers have scrimped on features that a game of its nature actually needed. Online multiplayer was essential to really make Tactical Mind something special, but it’s not in this game at all. 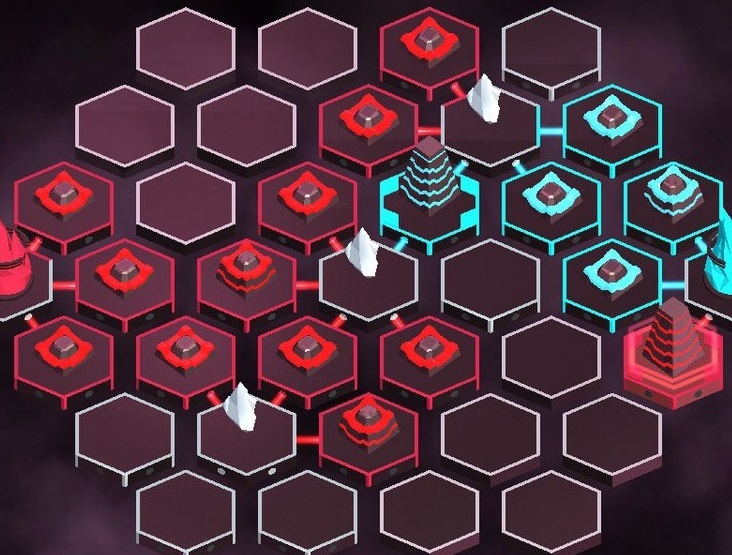 Only being able to play local multiplayer or against the AI means that Tactical Mind can’t become the habit-forming experience that would keep people playing on a daily basis for years, as its strategic depth deserves. Worse than that, the AI is rudimentary. 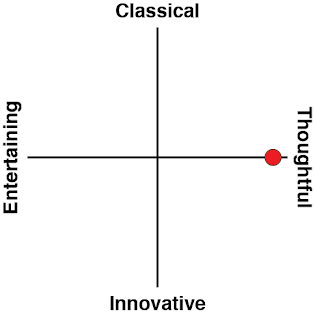 I certainly don’t claim to be a chess or Go grandmaster, but I’m decent enough at the kind of abstract strategy that these games offer, and as a result of that level of expertise I tore the AI to shreds on each difficulty setting with ease. The AI’s capacity to make very easily exploitable strategic errors either suggested that the developers didn’t really understand the depth of their own game, or (more likely) were worried that players might struggle to grasp it. Sadly the limitations that it has leaves Tactical Mind as a game that only holds long term value as a local multiplayer experience. I’ll still get enough out of it on that basis to justify its asking price many times over, but I can’t help but wish that the developers had a bit more confidence in the product to bump up the asking price and build some online infrastructure around the game so it could become the kind of competitive board game that I would play on a daily basis. It genuinely deserves to be one of those games. 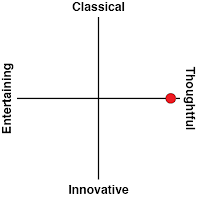 As it is, it's a clever, albeit limited, time waster.